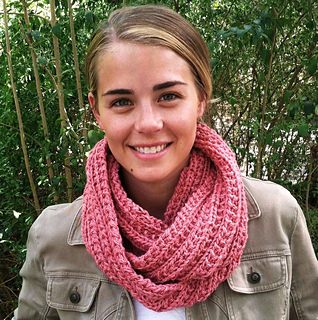 This wonderful design is quick and easy to knit in a luxury wool blend chunky weight yarn, or using two strands of dk weight yarn held together (as was used for the model). 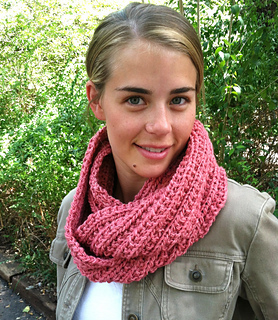 You will need approximately 350-400 yards if you are working with a single strand of chunky weight yarn. Working with Manos Silk Blend dk weight yarn, held double for the model garment, five skeins were used. 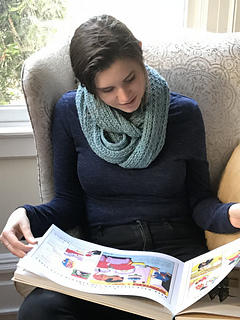 This is an easy to wear reversible pattern that is perfect for beginner knitters, but also just as great for accomplished knitters wanting a portable project to work on while on the go. 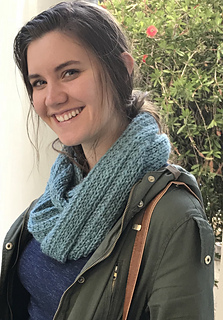 The scarf is worked on size 10 (6.00 mm) straight knitting needles, and multiple yarns are suggested for achieving this luxurious look for fall into spring.